Finally ... another grassy bald to traverse. This is Siler Bald, not to be confused with Silers Bald in Smoky Mountain Park. 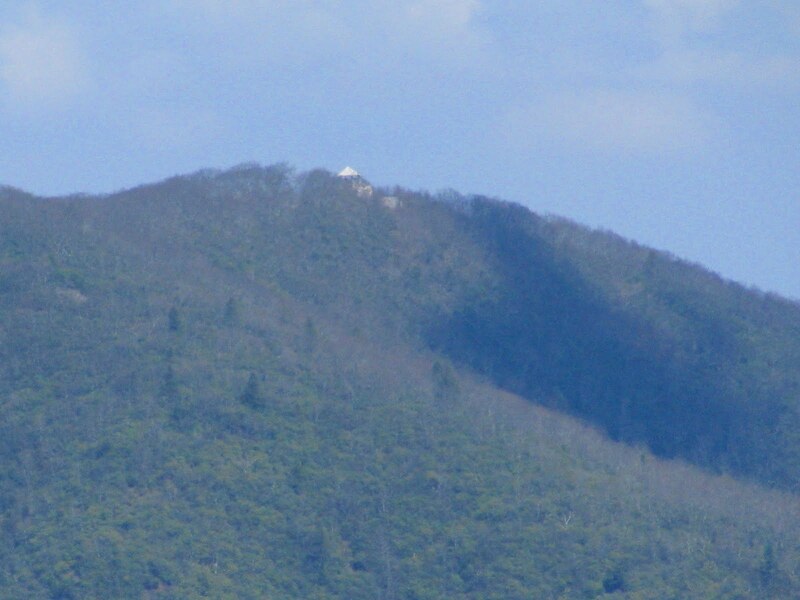 The AT passes through the lower end of the open area, so you have to take the quarter mile side trip up through the meadow to the summit - well worth the effort on a clear day. The day (Wednesday March 21st) didn't start out clear. 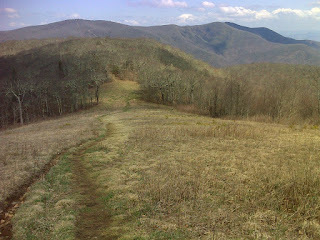 I started it with a return trip to Wayah Bald from the south side. Unfortunately it was foggy there, so no repeat of yesterday's fine views. The folks who visited Wayah this afternoon, though, had all the great viewing I had from Siler. I looked back with a telephoto shot, just to check on them. Once it cleared up (before noon) the day was warm yet refreshing up at these altitudes, and with no threat of rain. I hiked a total of 25 miles but they seemed like easy miles. There were long stretches of very gentle grades, and lots of pleasant smooth pathway. I accomplished everything in under twelve hours, all in daylight. The hike took me past Winding Stair Gap, where the AT goes out of its way (with footbridge included) to give you a front row seat view of this nice waterfall. I don't usually stop when I'm eating, but here I made an exception, lingering and soaking up the soothing rush of the water. I studied the different parts of it - how the water first glides, then plunges in separate cascades which merge in quick little pools, gather together and plunge again in a single unified climax. 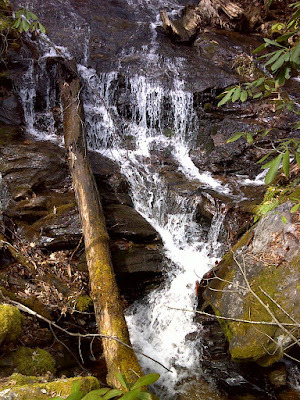 It seemed a perfect waterfall - just the way I'd design one as a water feature for my dream home. Your description of the falls made me want to stare at the picture longer. :) Hurrah for "easy miles".